An easy drawing tutorial suitable for beginners. 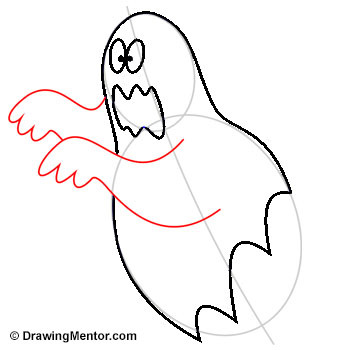 How to draw a ghost that is reminiscent of old classic cartoons such as Scooby-Doo. A great drawing to celebrate halloween and those wanting something simple to get their drawing juices flowing. No ghost has ever been captured by anyone or any authorities. In paranormal literature, ghosts are not limited to any one shape or types. A well-known ghost called a poltergeist has been recorded as a noisy and disruptive entity. This is why many movies have a poltergeist. Draw an oval shape circle on an angle. This is general shape of the body. Then draw a second, smaller oval shape sitting on top of the larger oval to be the head. Now draw a line through the center of each oval shape just like in the drawing image here. 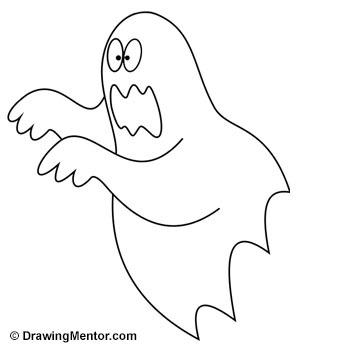 Have fun learning how to draw a ghost? Check out these other tutorials!